All this yarn, with the exception of the burgundy stuff in the middle, is from local sources. You are looking at handspun yarn made from wool, alpaca, llamba, and a few made from a blend of all those fibres including mohair. Over then next while I will share the items I’ve made with them over the last few months as I get ready for the Langley Weavers and Spinners Guild Annual Artisans’ Sale: Beyone Fibre. Stay tuned. This entry was posted in handspun yarn on September 30, 2010 by DianaTwiss. As I mentioned in my first post, when I first started spinning I bought a fleece from a friend Lani, who had a small flock of sheep. This fleece was from a ewe named Minnie who had lovely wool; soft and lustrous. Lani kept good care of her sheep and it showed in the high quality of the fibre and the fact that it wasn’t full of hay and manure. I washed, carded and spun up the fibre. It was terrific fun — I didn’t really know what I was doing — was relying on books, calls to fellow guild members and instinct. I was new to spinning so the yarn was slightly over twisted and didn’t have the loft and airiness that my yarns for sweaters now have. As a result, the sweater, when finished was dense and heavy. When I started spinning the yarn I didn’t have a project in mind, but I knew I wanted to make something “substantial”. A sweater for my youngest daughter seemed the best idea, because sweaters are “substantial” and she was small so it would not take too long. I dyed the yarn using kool-aid — easy as anything. The pink is from Strawberry Koolaid, the green from Lemon/Lime, the yellow is Pineapple and the white was good old Minnie. These Icelandic sweaters are a dream to knit up. You work the body in the round, the arms in the round and then you join everything up at the yoke, working in the round and working the pattern. The colour work keeps you going as each row lets you see the picture develop. The sweater was heavy when completed, but my daughter loved it and wore it until it didn’t fit her anymore. Then we passed it along to another wee one who also wore it until she outgrew it. A lot of hard wear and it still looks good. I guess that’s what you get with over twisted yarn. This entry was posted in handspun yarn on September 24, 2010 by DianaTwiss. 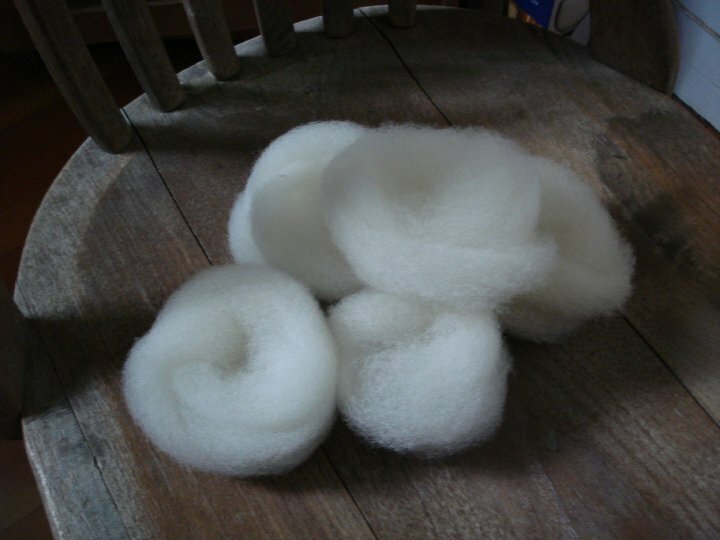 This spring I purchased a 10lb lamb fleece from a fellow guild member named Ann. Ann raises a small flock of Romneys on a farm which is 11.5 miles — 18.4 km (as the crow flies) from my place. Here’s an up-close look at what a lamb’s fleece looks like before it’s washed/scoured. Double click on the photo and you will get a larger view. You can see it is full of vegetation — bits of grass and seeds; lanolin — the lovely oily stuff that makes your hands really soft; suint — the dried sweat from the sheep; and other surprises like dead bugs and clumps of sheep dung. After you scour it — that’s the word we fibre folk use when we talk about washing wool — it looks totally different. To scour means that you wash it in really hot water with soap to clean it of all the oils and dirt — allowing easy fibre processing and, if you choose to dye it, to allow the dye to adhere to the fibre. Here is what washed fibre looks like. This small batch is hanging on my back fence. I tilted the wire fencing to make a shelf — clever of me eh? It helped the fibre dry quickly because the warm air could circulate all around it. Once it was dry, I brought it into the house and got it ready for spinning. I decided to use my wool combs so I could easily and quickly remove the final bits of vegetation that were still in the locks. Here’s what the combed nests look like. Aren’t they heavenly? Doesn’t that just make you want to spin? I was so happy with this fibre. It is soft, not super soft, but soft with a springyness to it which made a lovely yarn with some give. I will post photos of the yarn I made next time around. This batch of cleaned fibre was about 3lbs of the fibre. You can see you can get a lot of yarn from a 10lb fleece. Thanks Ann and your lovely lambs fleece. This entry was posted in romney sheep, scouring wool, spinning on September 23, 2010 by DianaTwiss. 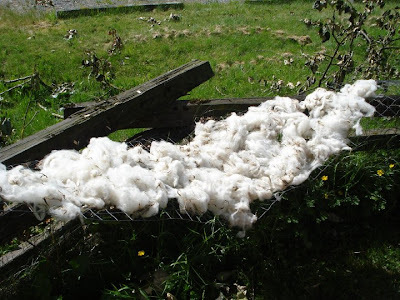 This blog is about my efforts to create clothing items from fibres that come from within a 100-mile radius of my house. It is inspired by the book A 100-Mile Diet: A Year of Local Eating by Alisa Smith and J. B. Mackinnon. I initially resisted reading that book, feeling that it would have a repremanding and superior tone that would result in guilt and total lack of enjoyment for anything that I ate following that. But it wasn’t that way at all. It’s a terrific and inspiring book written in an intelligent and engaging manner. And it got me thinking. How much of our resources are spending moving stuff around the planet, all in the name of fashion? How many of us have forgotten how to create clothing and fabric, leaving it all in the hands of technology and third world countries? I joined the Langley Weavers and Spinners Guild in January 2000 with a deep desire to learn how to spin, right then and there. One of the seasoned members of the guild advised me to get a wheel and buy a fleece. In a very short time I purchased a second-hand spinning wheel [Ashford Traditional] and started processing a 7 lb fleece from a ewe named Minnie. The first yarn I spun was over twisted, thick and lovely. The sweater I made for my 6 year old weighed about 2 1/2 lbs. I dyed the fibre using koolaid, because they were safe and easy to obtain. I didn’t have the brain power or space needed to get into dyeing in a “real” way. The sweater was gorgeous and she loved it, despite its weight. She wore it with pride until it didn’t fit her anymore. I loved that yarn and the whole process of making it. I had to skirt the fleece — take out the inevitable animal bits, then scour the fibres — wash them in very hot water to rid it of lanolin, suint and dirt. After the washed fleece dried, I hand carded it and spun it up two-ply. Every spring after that I attended the local fleece sale. It was a once a year chance to buy a fleece from a farmer in the region. I purchased many pounds of fibre at this sale every year, looking forward to the heat and sun of summer to help dry the fleeces. From this I learned that in our area we have the capacity to produce some exquisite fibres. Over the years I have bought Ramboulette, Shetland, Clunn Forest, and of course Romney from local sheep farmers. Over the next while I will show you [as soon as I can find my camera] yarns and items that I have made with locally sourced wool, alpaca and llama. You will also hear the whining frustrations from my attempts to obtain more fibre now that the annual sale is no more. This entry was posted in spinning, wool, yarn on September 18, 2010 by DianaTwiss.